Do you need to feed a specific diet to your senior cat? What do you think? Did your grandparents change their diet upon retirement? They might eat less to avoid some unhealthy foods, often because their doctor told them, but mainly, they do not shop at specialized senior grocery stores, nor do they buy meat or milk for oldies. And it shouldn’t be different in cat world. Senior cats do not need a specific diet because of old age. However, their sensitivity to food quality is higher than their younger and adult counterparts. Get as high a quality of cat food as you can. That means a high amount of protein, moderate amount of fat, and little to no carbohydrates. Learn how to choose good cat food here. Wet food is much more appropriate for adult cats. It is better than dry food for all cats, but for seniors it becomes ever so important. Modify your cat’s food intake according to his/her body shape. If your cat is gaining weight above a healthy level, reduce the amount of food; if their weight drops, increase it. IMPORTANT: Certain health conditions can require diet variations. Discuss them with your veterinarian. 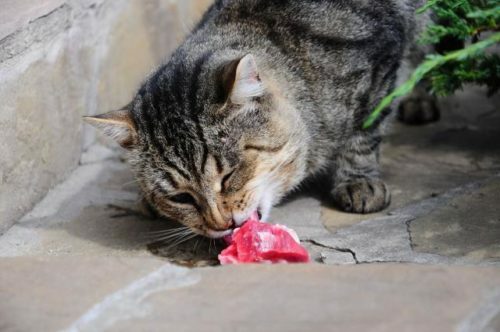 How much should an older cat eat? Cats between 7 and 9 years of age have a decreased requirement for energy and increased requirement for protein (that is, protein/fat ratio must be higher) due to slower metabolism and lower activity level. Cats over 10 years of age have an increased energy requirement and significantly increased protein requirement due to loss of muscle mass. Note that above guidelines are general, and your cat should be assessed individually. Besides, their energy requirement DOES NOT change overnight on their seventh birthday. It is a gradual process. Therefore, it is not necessary to change your cat’s daily food intake because of their age, but rather according to their weight fluctuations. You can learn to asses your cat’s body weight here. NOTE: If your cat gains or loses weight rapidly, take them to a veterinarian. 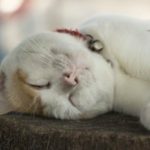 What food should you choose for a senior cat? In theory, older cats require an increased amount of highly digestible protein, moderate amount of fat, and almost no carbohydrates. In practice, this describes a good quality cat food, and all cats, regardless of their age, should get it. At a senior age, it becomes more important. Does your older cat require specialized senior cat food? First, not all cat foods are equally good. While senior cats require an increased amount of protein compared to younger cats, some manufacturers provide quite the opposite. That is nonsense that originated in research that discovered that increased protein in the diet of rats increased their risk of kidney disease. It is now known that cats are not rats, even though their similar biology often allows experimental results to be interpreted for cats, humans, and other species. An increased amount of protein DOES NOT promote kidney disease in cats and dogs. Cats, as true carnivores, have a high demand of protein to maintain proper health. 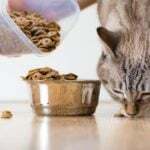 Second, does your cat’s food provide adequate amount of calories? You already know that cats older than seven years are less active and need lower calories, while cats over 10 years require more energy. 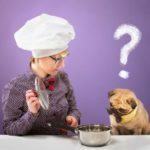 Does your cat’s food provide it? Check the label. Third, most senior cat foods are simply of better quality. An increased amount of protein is good. But we are not sure why it was decreased in the first place. Many prescription diets follow a similar strategy. For example, food for diabetic cats carries a decreased amount of carbohydrates. However, if there had been a decreased amount of carbohydrates right from the start, maybe there’d be no diabetes in the first place. Premium cat food* manufacturers do not offer different foods for life stages. They provide high quality food for cats starting at an early age. *- those foods that are actually premium, not those who merely brand themselves as premium. What do we feed our senior cats? As of writing this, we have one cat that is 9 years old and two cats that are 8 years old. Thus they fall into the reduced energy and increased protein category. What do we feed them? We feed our cats a homemade diet from a recipe very similar to the one found here. It is not a special senior cat food, and our cats have eaten it for years. 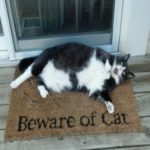 In recent months, we’ve been experimenting with reducing the amount of fat in their diet (which increases the protein-to-fat ratio), but this isn’t mandatory for senior cats. Note that this particular diet does not contain any carbohydrates. We started feeding it to them for one reason: we were not able to find high quality cat food on our local market. Now we get a high-end premium cat food as a medium-to-low cost dry food with a little work. Besides, we know exactly what we put in there. At the same time, we do not pay much attention to reducing the amount of food our cats receive because of old age. We follow their weight changes and adjust their portion sizes accordingly. The food is still the same as our cats received when they were 6 years old: a high amount of animal source protein, a moderate amount of fat, and no carbohydrates. Our senior cats are healthy, their coat is shiny, and their litter-box has almost no odor.